As you walk in you are met with a modern designer kitchen, equipped with top of the range appliances. This is open plan to a large dining area, which seats 8 guests and a TV lounge with comfortable couches. Doors lead out onto a balcony with a pool area and spectacular views of the Atlantic Ocean. 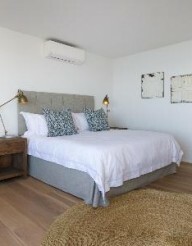 The master suite has a King-size bed, sea views, an en-suite with bath and a shower and access onto the balcony.